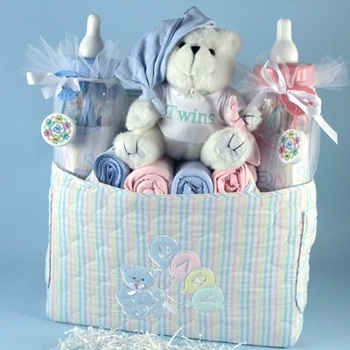 A splendid and thoughtful gift idea for any new parent of twins, our twins tote bag ensemble can be customized with pink or blue items depending on the genders of the twins. Quilted cotton tote bag is ideal for traveling, and measures 18 by 5 inches and stands 12 inches tall, featuring two side pockets and enough room for plenty of baby gear. The tote arrives packed with a terrific selection of outfits, infant essentials, toys, keepsakes and more. Additionally, the recipients will find a cute little plush teddy bear wearing a special twins embroidered tee shirt! All layette items are premium grade and made here in the United States! Please specify genders when ordering. Once finished, we will wrap the entire set in opaque white tulle for a stunning presentation to the new parents�includes free shipping.